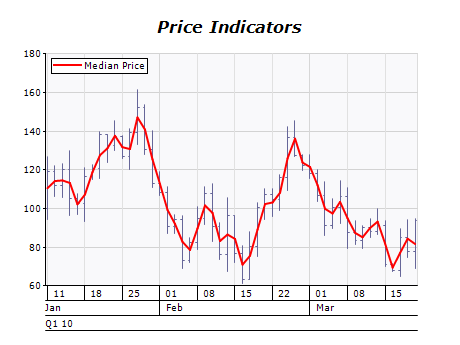 The Median Price indicator is the midpoint of each day's price. This average price is useful when you want a simpler view of prices. The Typical Price indicator is an average of each day's price. Some investors use the Typical Price rather than the closing price when creating moving average penetration systems. The Weighted Close indicator is simply an average of each day's price. It gets its name from the fact that extra weight is given to the closing price. When plotting and back-testing moving averages, indicators, trendlines, etc, some investors like the simplicity that a line chart offers. However, line charts that only show the closing price can be misleading since they ignore the high and low price. A Weighted Close chart combines the simplicity of the line chart with the scope of a bar chart, by plotting a single point for each day that includes the high, low, and closing price.